Pigeon-holed as a cheerleader’s car in its first life, the VW Cabriolet has been uncovered by many early-water-cooled VW enthusiasts as the good car it is – a 4-place convertible with decent power (especially with the manual) and good passive safety for the time. Of course, stock power is never enough for some folks, and that’s why there’s another popular pastime among VW fans – dropping in a later VW factory powertrain to add power. So that brings us to this 1989 VW Cabriolet for sale for $3000 in Revere, MA. Since cars like VW’s Scirocco are not seen as classics by many in the vintage car scene, they’re an unrecognized bargain. For some reason, Italian design plus simple German mechanicals do not add up to a usable classic car, yet at this point the Mark 1 cars are at least 34 years old. If you’re not convinced by age or design, how about the fact these Karmann-built cars rust with the best of them and can suffer electrical problems brought on by leaking windshield seals? 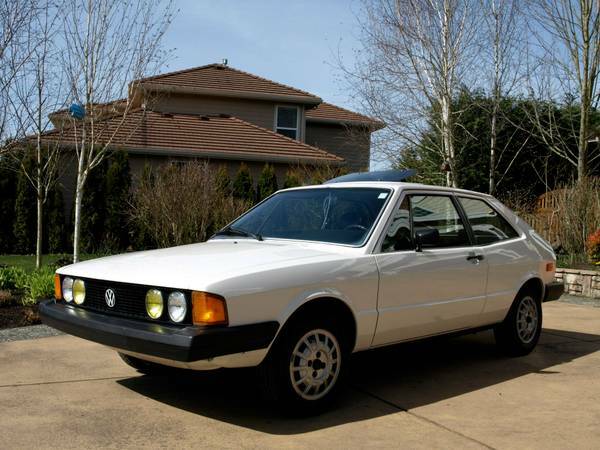 Check out this 1978 VW Scirocco for sale for $2800 in Vancouver, WA.